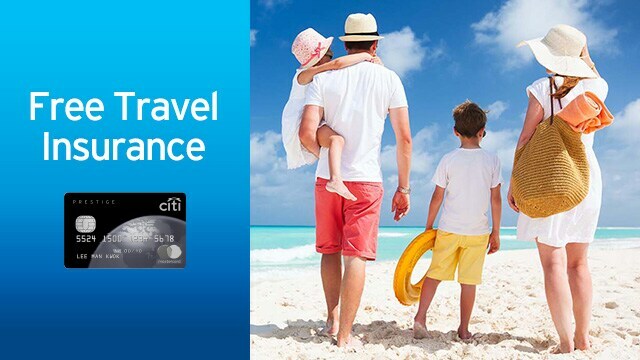 Pay in full or redeem* for flight tickets/ accommodation/ travel tours with your Citi Prestige Card, you and your family can enjoy free travel insurance. Upon expiration of the manufacturer's warranty, the extended warranty benefit duplicates the terms of the original manufacturer's warranty up to one (1) full year. Eligible purchases repaired or replaced for up to US$500 per claim and a maximum of US$2,000 over a 12 month period of insurance. Benefits are provided for the costs to repair, replace, or provide reimbursement for the item if it cannot be repaired or replaced. Purchase Protection Insurance provides coverage for loss of a Covered Purchase made with Citi Prestige Card due to Accidental Damage or Theft occurring within ninety (90) days from the date of purchase as indicated on the store receipt. Coverage includes up to US$3,000 per claim and maximum of US$20,000 over a 12 month period. Covered Purchases include worldwide purchases subject to the terms and conditions of the policy. Wallet Guard Insurance provides worldwide coverage and reimbursement of up to US$500, and is subject to the terms and conditions of the policy. Covers physical damage to rental car incurred during a covered rental. For up to US$50,000 per claim, this cover is on a worldwide basis. By using Citi Prestige Card to reserve and pay for the entire auto rental, this insurance will be automatically in force up to the stated limits and subject to the terms and conditions of the policy. ^Please visit here for full insurance coverage, exclusions and terms and conditions.